You are currently browsing the Columbia Hearing Center blog archives for May, 2014. Your memory of sound isn’t as good as your memory for other senses. A group of researchers at the University of Iowa have found that humans don’t remember sounds as well as they do other stimuli. People tend to remember things they have seen or felt better than things they have heard. According to the research, the brain seems to use separate pathways to process different types of stimuli and indicates that reinforcing concepts with visual aids would make it easier for people to learn. This may also help to explain why students have a difficult time remembering what they learned in a lecture. The researchers tested over 100 students by having them wear headphones to listen to various pure tones sounds, look at various shades of red squares, and feel differing vibrations by gripping an aluminum bar. There were delays of one to 32 seconds between the tones, vibrations, and squares. The students had a more difficult time recalling tones they heard as opposed to remembering the appearance of the squares and the feel of the vibrations. Although students’ memory declined across the board as time delays grew longer, the decline was much greater for sounds, and began as early as four to eight seconds. Another experiment had students listening to recordings of barking dogs, watching a silent video of a basketball game, and having them touch day to day items without being able to see them. The students were asked to recall everything they heard, saw, and felt an hour after the experiment and again a week later. The result was that students had a more difficult time remembering the sounds they listened to but could remember more about the video and the objects they touched. This knowledge will hopefully help educators reach students more effectively. Adding visual or tactile aids during a lesson may make it easier for students to retain information longer. Nearly 36 million people in the US alone have hearing loss. Most of these people would agree that shouting doesn’t help the conversation, it only increases the frustration. Why? 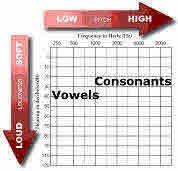 Most hearing losses are greatest in the higher frequencies where consonants lie, and less so in the lower vowels tones. When one yells, they increase glottal tones such as low frequency vowels which typically do no good for most hearing impaired people. To illustrate this, you can probably yell an “O” or “A” sound across a city block, but it’s really difficult to yell a “T” sound. 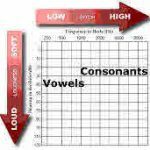 While consonants are higher pitch than vowels, they also convey more word information in a conversation. The consonants provide essential pauses in speech, separating syllables and words from one another. When they are missing, words can be perceived as running together and speech perceived as mumbling. The best way to help someone with hearing loss, besides having their hearing checked, is to take a deep breath; don’t react emotionally, but speak more clearly, distinctly, and at a moderate pace – sort of like a newscaster.